KUALA LUMPUR- Two UKM lecturers, Dr Emma Mirza Wati Mohamad and Dr.Mohd Helmi Ali has been choosen among hundreds of applicants, to be part of the CEO@Faculty 2.0 Programme, organised by the Ministry of Higher Education. The program aims to expose university lecturers below 40 years old with a doctoral degree in the rudiments and operations of the industry began in April 2017. According to the Minister of Higher Education, Dato’ Seri Idris Jusoh, the programme will see selected CEOs voluntarily coaching choosen young university lecturers to become a leader, hence the tagline ‘Coached by the PRO’. 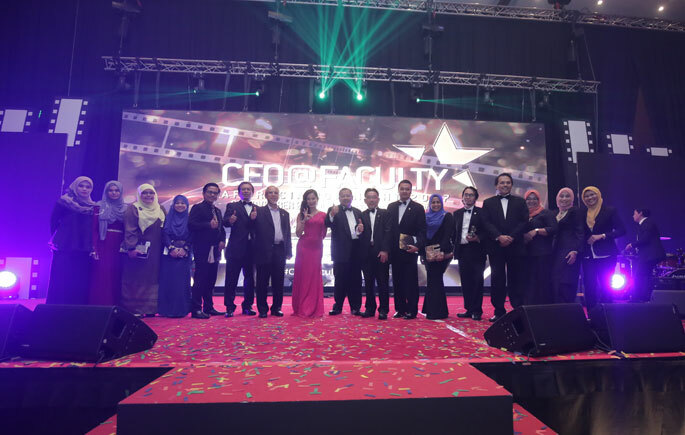 “These lecturers, referred as fellows, were presented with a specific six month assignment in order to embrace the corporate culture in managing a high profile company,” he said at the CEO@Faculty Appreciation Night 2017 at the Kuala Lumpur Convention Centre, yesterday. He said the CEO@Faculty programme brings together top CEOs and industry players into Malaysian universities to share their knowledge and experience with students and the university community. “We have more than 70 CEOs, 90,000 students and academicians benefitted from this programme with 200 talk sharing sessions in 1,500 hours. “I told the Vice Chancellor that in future, 40 percent of lectures should be conducted by key players in the industry. “Academia and industry are one. Let us work together to redesign our curriculum and reskill our students and lectures. In the era of Industrial 4.0, the key to success is to collaborate,” he said.